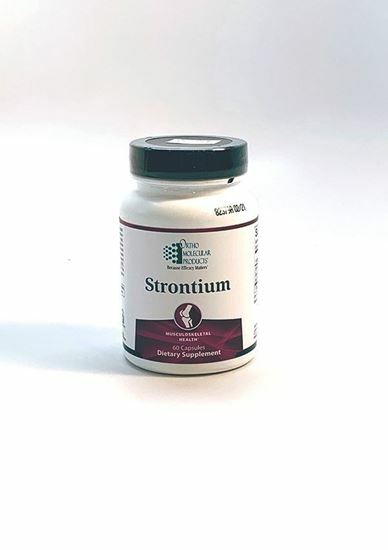 Strontium is a mineral with similar properties as calcium and is widely used to support bone health. 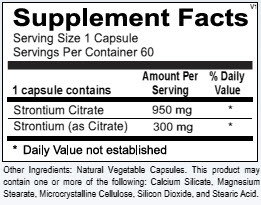 Studies have shown that supplementation with strontium is a safe and effective way to help decrease bone loss and build bone. Strontium (as Citrate) is a mineral with similar properties as calcium. It is unique in that it increases bone formation while also preventing bone resorption. 1. Dahl, S. G., Allain, P. et al. Incorporation and distribution of strontium in bone. Bone. 2001; 28(4):446-453. 2. Marie, P. J., Ammann, P. et al. Mechanisms of action and therapeutic potential of strontium in bone. Calcif Tissue Int. 2001; 69(3):121-129. 3. Marie, P. J. Optimizing bone metabolism in osteoporosis: insight into the pharmacologic profile of strontium ranelate. Osteoporos Int. 2003; 14 Suppl 3:S9-12. As a dietary supplement, 1 capsule two times per day or as recommended by your health care professional. For maximum Strontium absorption, do not consume with calcium supplements.